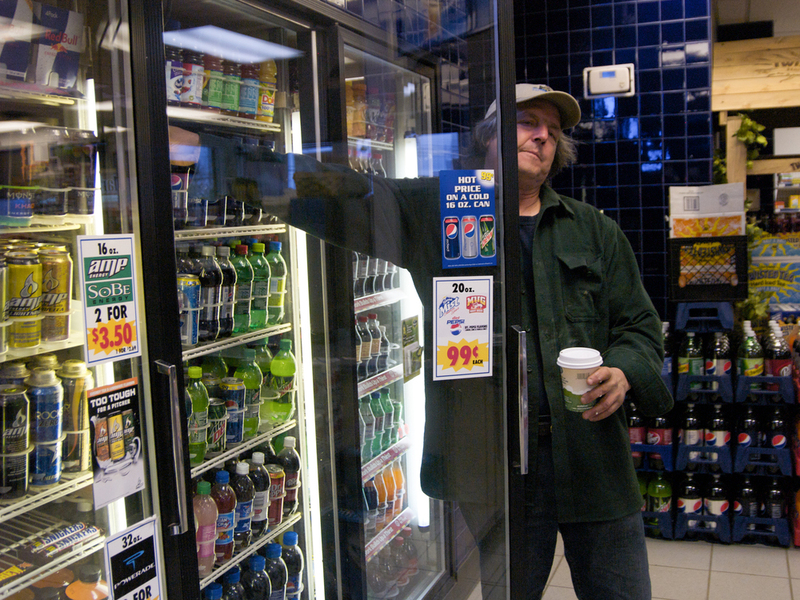 (04/18/09) On his way to the dock, Carter Newell stops in at a local gas station for a cup of coffee and a soda. He has about eight or nine hours of hard work ahead of him. (04/04/09) Cater Newell pulls on a pair of boots. 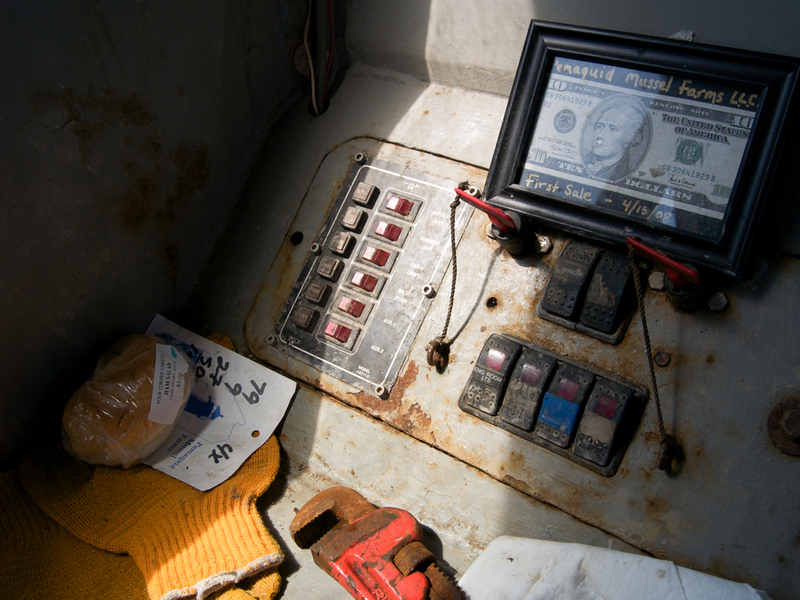 Rubber overalls and rubber boots are needed before getting to work on the barge. The job is a messy one and the crew have have to be prepared to work in all kinds of weather. In rough weather, waves wash over the deck of the boat, some- times spilling the mussels over the side and dur- ing the winter it’s not unusual to spend the first hour of the day shovelling snow off the deck. 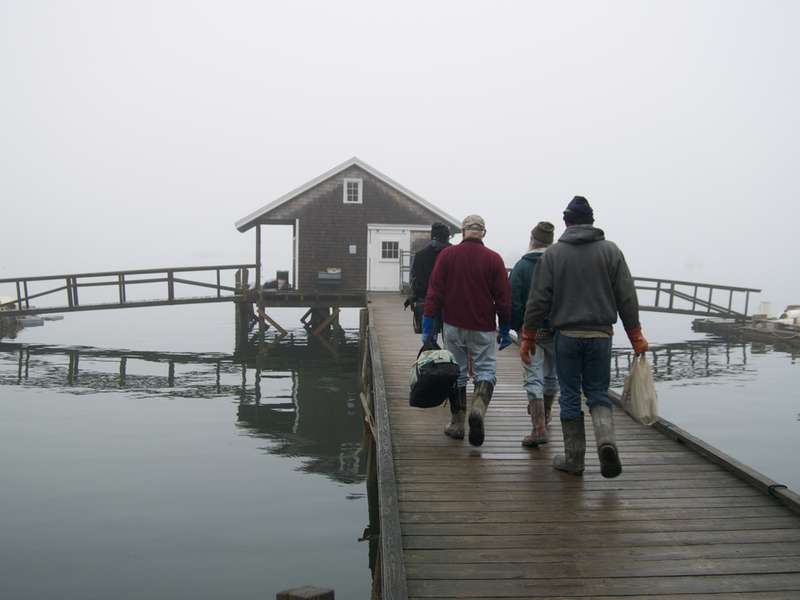 (04/04/09) The crew of Pemaquid Mussel Farms (from left to right), Carter Newell, Peter Fischer, Joe Larrabee and Greg Thompson, head down the dock to the skiff that will take them to the mussel farming barge. The barge, as well as the rafts where the mussels are grown, are anchored just off shore. 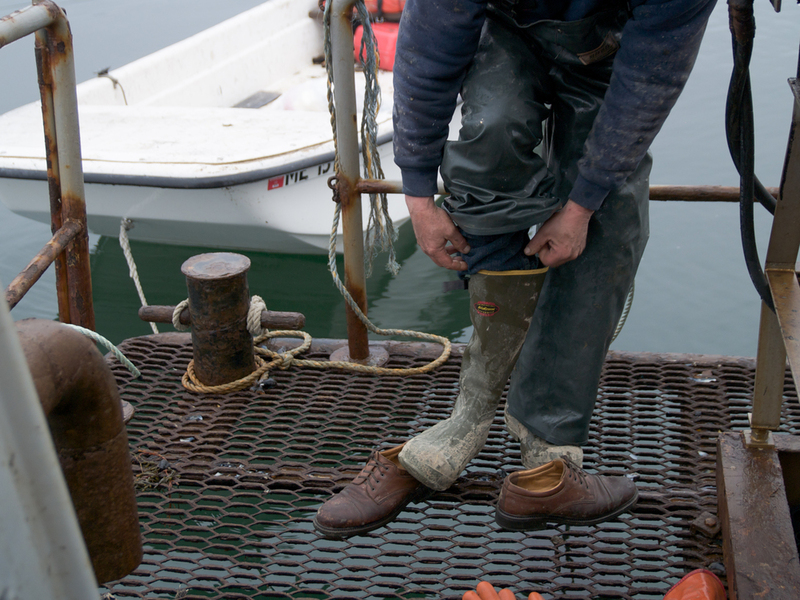 (05/09/09) Once the mussels are deposited onto the deck of the barge they have to be shaken off the ropes by hand. Mud flies in the air and Peter Fischer (left) and Greg Thompson (right) end up covered from head to toe by the end of it. 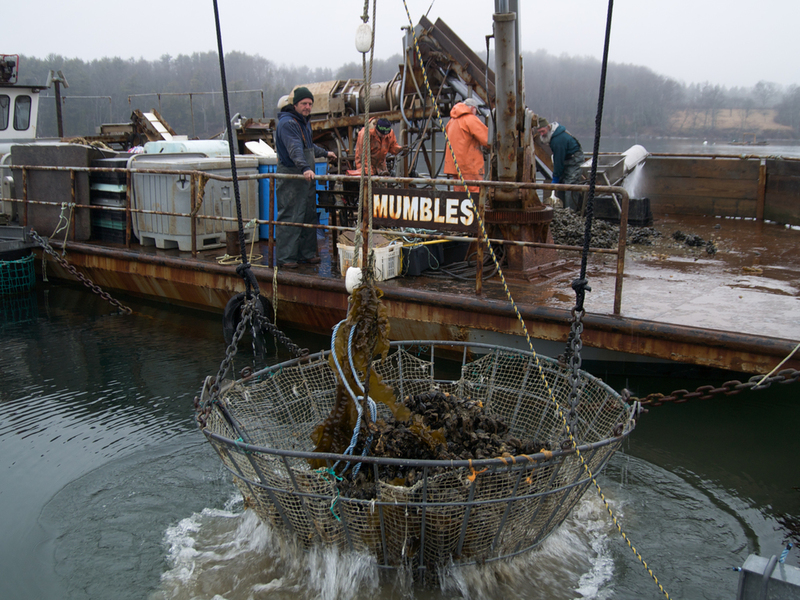 (04/25/09) Pemquid Mussel Farms has existed for barely a year and came into being when Great Eastern Mussel Farms went out of business. The four crew members prefer the situation this year with all of them being owner/ operators of the company. (04/04/09) Greg Thompson (left) and Carter Newell (right) watch the conveyer belt carefully in order to remove any mussels with broken shells. Although some jobs can be somewhat te- dious, each task never lasts for too long and by the time one starts to get boring it’s usually time to switch to the next. (04/04/09) In the middle of processing the mussels, loud clunking noises start coming from the debisser and the machines have to be turned off so for repairs to be made. The debisser is a machine which removes the bissel threads from the mussels so that they are ready to be thrown straight into the pot at a restaurant. 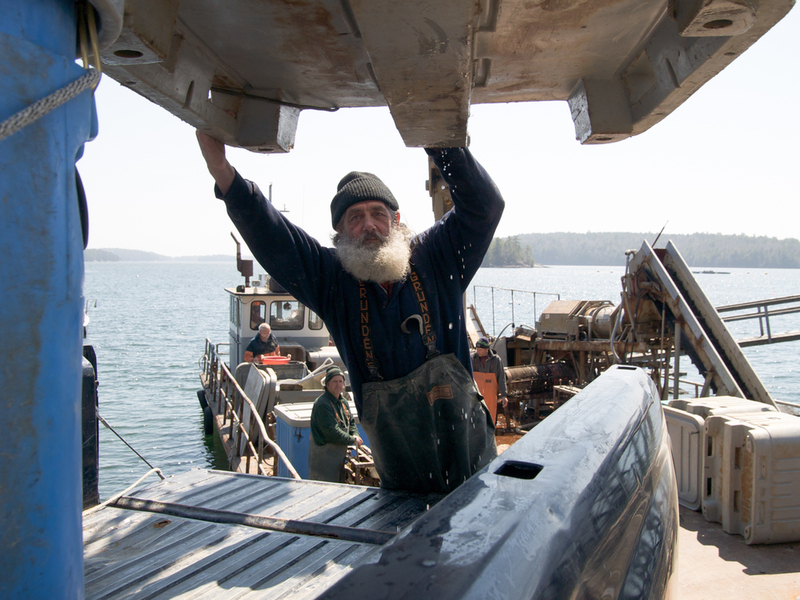 (04/04/09) Joe Larrabee looks down a conveyer belt where he and others are sorting through the day's haul of mussels. 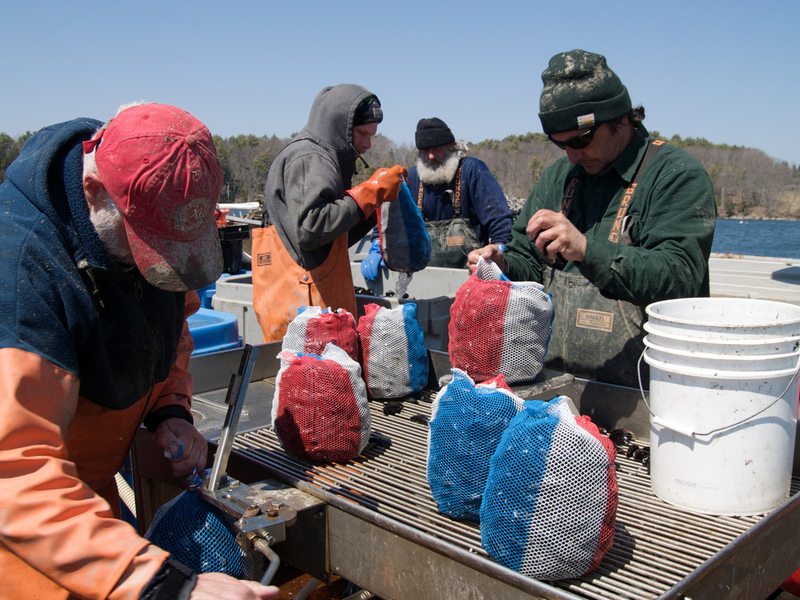 (04/25/09) Peter Fischer, Greg Thompson, Joe Larrabee and Carter Newell (from left to right) weigh mussels by hand in 10 lb bags before packing them into plastic totes and cover- ing them with ice. Red white and blue bags show that the mussels are American and not Canadian. 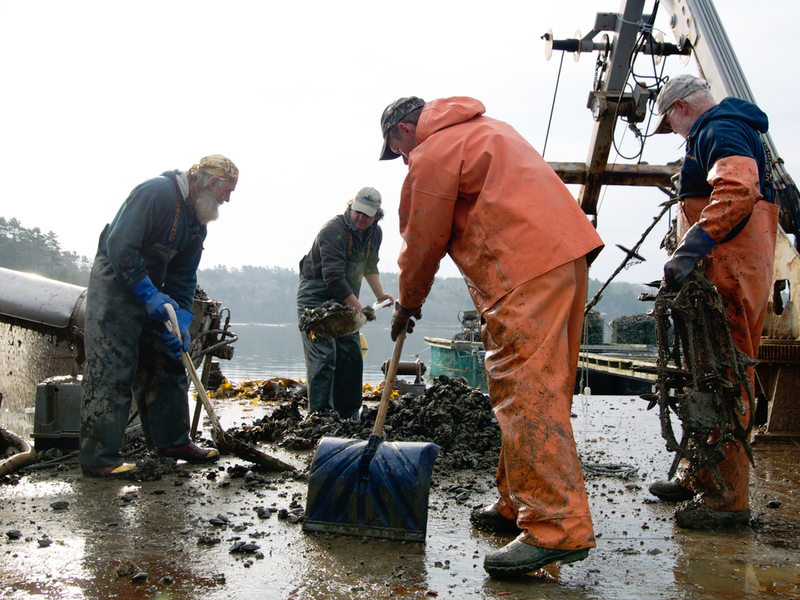 (04/04/09) At low tide, Carter Newell uses the crane to lift bins of bagged mussels up onto the dock. The crane was designed to lift a surprising amount of weight and was once even used to lift up the entire barge by pushing off the bottom when it became grounded in shallow water. 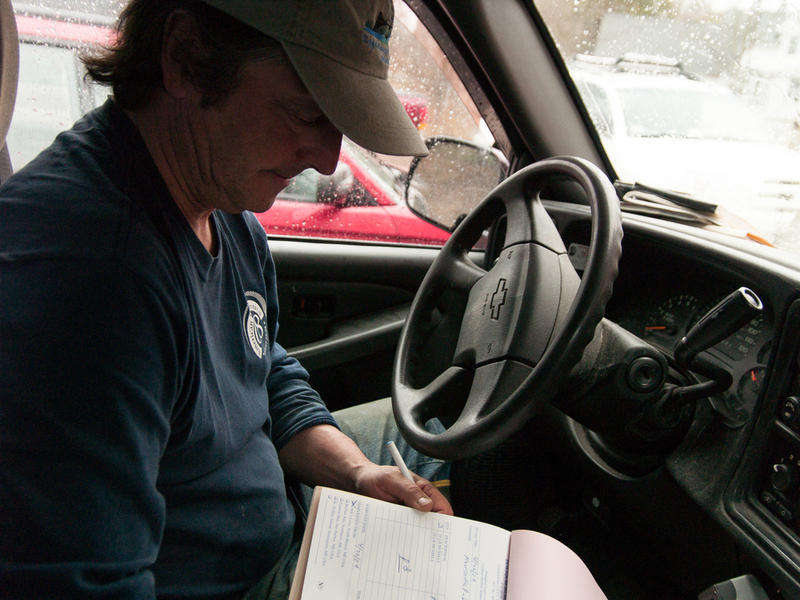 (04/25/09) Joe Larrabee guides one of the plastic totes filled with bags of mussels onto the back of a pickup truck. Once all the mussels are loaded onto the different trucks, the crew drive off to various restaurants and wholsalers to make their deliveries. (04/22/09) Carter Newell checks his records while making mussel deliveries.